Animal Crossing: Wild World is the wonderful sequel to the heartwarming life-simulation game Animal Crossing that was released years ago for the Nintendo Gamecube. New additions in this installment of the series include Wi-Fi connection link, more events, more characters, more buildings, more Fishes, more insects, more activities, and much more items to collect. 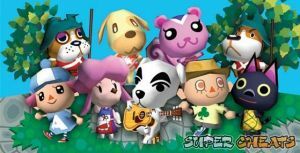 With the recent popularity of Animal Crossing: New Leaf for the Nintendo 3DS, we will take you to a lovable trip down memory lane as we provide in-depth gameplay, content, tips, strategies, management techniques and complete lists of collectibles for this classic entry in the much-adored series. How do I change the time and go to settings on Animal Crossing Wild?? And if I want to marry Bill how do I go about doing so? To get a present in the sky, use a slingshot. To get your friend code, go to the building at the back of your town that has a wide, black entrance. Inside there are two dogs; go to the one on the right. Ask him about your friend code, he'll tell you that you need to set up your WFC with a source of wifi, so do it and connect, he'll then give you your code. How can you get a present up in a sky? sum1 tell me how 2 marry animals in animal crossing!PLZ!! !I REALLY wana merry rosie. how to get my friend code? how do you get 99,999 bells WITHOUT needing 150,000 bells? can you actually get a dog if you have one please tell me how because every one says different answers PLEASE HELP!!! How to get 99,999 bells. put 50,000 bells and in your hand100,000 bells change clock at DS menu change it to 2000. Do the same thing after you exit acww or acnl but change it to 2099.A letter will come saying that you got 99,999 bells for 30 days of interest!!! 14Can you change the name of your town after you start playing? 47Who do you want in your town?